Rennes train station, our jump off point for Mont Saint-Michel. The TGV ride from Paris' Montparnasse station to Rennes took approximately 2 hours and 20 minutes. Leaving the train station be sure to take the North exit to get to the bus station (Gare Routière). The plaza in front of the train station. If you don't see this place coming out of the station you might have taken a different exit. With the train station behind you, the Gare Routière is immediately to the right. Be sure to buy your bus tickets at the counter before boarding the bus (they don't sell tickets on board the bus when starting your journey in Rennes). Buy round trip tickets (billet aller-retour) if you'll be going back to Paris via Rennes. Unlike our 2010 visit where the bus drove all the way up to the walls of the Mont, this time we were dropped off at the new terminal and car park located at the mainland, a few meters at the start of the causeway. Starting in June 2013, access to the Mont through the causeway can only be by foot (30-45 minutes), free shuttles (les navettes) or horse-drawn shuttles (la Maringote). The Tourist Information Center at the new terminal/car park. The plan to allow the tides back that will make the Mont an island again, Project Mont Saint-Michel. La Maringote at EUR5.00 per person. My sisters and I took the free shuttle. Even with all the on-going construction seeing the Mont again still takes my breath away. Just imagine my sisters awe-struck expressions upon seeing it for the first time. Then out comes the cameras! View of the Mont's restoration project as seen from the abbey walls. Too bad we didn't get to see the tides on this visit. Grand Rue or main street. The only street inside the Mont that leads to the abbey can be overwhelmed with modern-day pilgrims aka day trippers. We were lucky it wasn't so busy during our visit. La Vieille Auberge where my sisters and I stayed. The inn has rooms at their main building along the Grand Rue (above) and at their annex farther up the street. 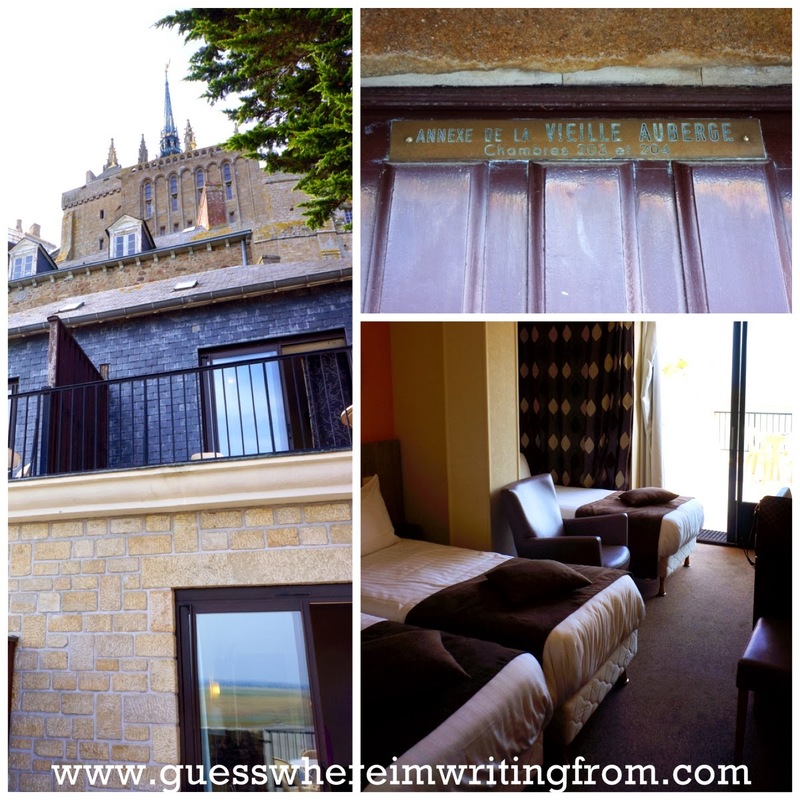 We got a room at the annex (below) with a great view of the abbey's spires. And a lovely view of the bay from our room's terrace. We also got a view of Mont Saint-Michel's cemetery and the on-going construction at the bay. The archangel Saint Michel at the top of the spire. Is that a huge fireplace or a really tiny tourist? It's both actually (but it's still a huge fireplace). My lovely sisters, the gorgeous H and the stylish P. at the salle des Chevaliers. The south wall of the abbey's church. An eerie quiet fills the Grand Rue after all the day trippers leave. The abbey all lit up for the night. It was a short but wonderful visit with my sisters at the Mont. I hope I get another chance to go back with the Big K after the restoration when Le Mont Saint-Michel becomes an island once again.